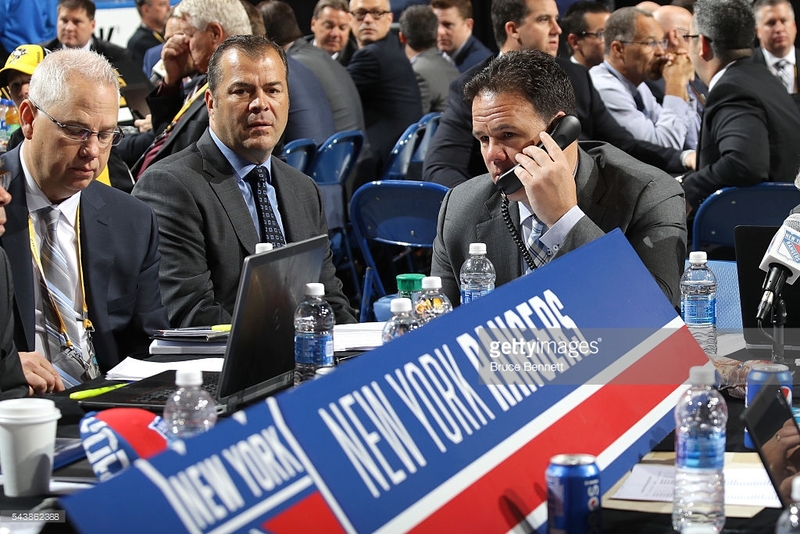 Last year, the New York Rangers didn’t have a single pick in the top-80 of the NHL entry draft. Sean Day became their first selection near the end of the third round, and the team was forced to take a lot of high-risk prospects thanks to limited resources in the early rounds. As of now, the Rangers still own their first round pick for the first time since 2012. If they hold on to it and select 21st overall, the Rangers will almost certainly be selecting a player that will jump up to the top of their prospect depth chart. That said, it wouldn’t be at all surprising if the Rangers were to trade down from 21 in order to pick up a few extra draft picks since they currently don’t own any in the second or third rounds. With that in mind, here is a look at some potential draft picks for the Rangers this June. Callan Foote is a guy that has fallen out of favor with some as the season has gone along. Once seen as a top-10 pick, the 6’3 rearguard is going to make someone drafting in the second half of the first round very happy. Foote is a two-way defender that is smart on the ice and has great instincts on both the offensive and defensive side of the puck. He is able to use his size and strength to his advantage, though you’d like to see him be more physical, especially in his own end. He’s not the kind of defender to lead the rush with the puck, but he’s got a very good first pass and often makes the smart play when starting the breakout. There is a simplicity to his game that is both a strength and a weakness – he’ll never be counted on to rush the puck or add much in the way of offensive numbers, but he is a dependable player that coaches can rely on to play big minutes. He’s a bit of a safe pick, and if he’s on the board at 21, he’s the kind of the guy the Rangers could select knowing he’s very likely to be impactful at the NHL level, even if he doesn’t have as high a ceiling as some of his peers. A re-entry into the draft, Polunin just turned 20 a few days ago. He was outstanding for Russia at the World Juniors this past winter and has already shown an ability to play against men – having already played a year and a half in the KHL. Polunin is a highly skilled winger that has been passed over in the draft already because of his size and contract with the KHL. He’s got the skill worth taking a chance on and could be NHL ready a lot quicker than most. Here is a more in-depth look at Polunin. He’s even smaller than Polunin, but he might be even more skilled. Garreffa is only 5’7, but man can he move around the ice with the puck on his stick. He’s quick, skilled and can put the puck in the net. For a team that is willing to take a chance on him in the late rounds, Garreffa is going to be a very intriguing prospect to watch develop. A former first round pick in the QMJHL draft, Chainey is a lot like 2016 pick Sean Day in that he is a guy that scouts expected to develop a lot further than he has. The thing is, Chainey is one of the youngest players in the draft and has a lot of room to mature, both physically and mentally. If he is able to use the extra time and put a game together that reflects his raw talents, he definitely has the potential to be an impact player in the NHL. Another of the younger prospects in the draft, Zetterlund had a great U18 tournament, leading Sweden in scoring and showing the ability to be the lead player in just about every situation. He was very good in Sweden’s junior league last season and earned himself a call up to the SHL. He was held without a point in his 14 games at the top level, but the fact that he was even in an SHL lineup at 17 is huge. A smart player that can be left alone to develop in Europe for the next few years – Zetterlund’s is a name we’re likely to hear a lot during next year’s World Junior Championship. Jones is a guy that was thrust into a role he likely wasn’t ready for on a very young Niagara Ice Dogs team. After only 9 points as a rookie, Jones took a huge jump in production this season. He is a very good playmaking center that can create scoring opportunities and knows when to defer to his wingers. He’s got the size to stick at center and the hockey instincts to contribute in all three zones. He has the chance to be more a lot, but at the very least, Jones will likely be a good depth forward at the AHL level, which is all you should be expecting when the picks get to the 200s. Previous 2017 NHL Entry Draft: Who Could the Calgary Flames Select With Each Pick? Next 2017 NHL Entry Draft: Who Could the Ottawa Senators Draft with Each of Their Picks?